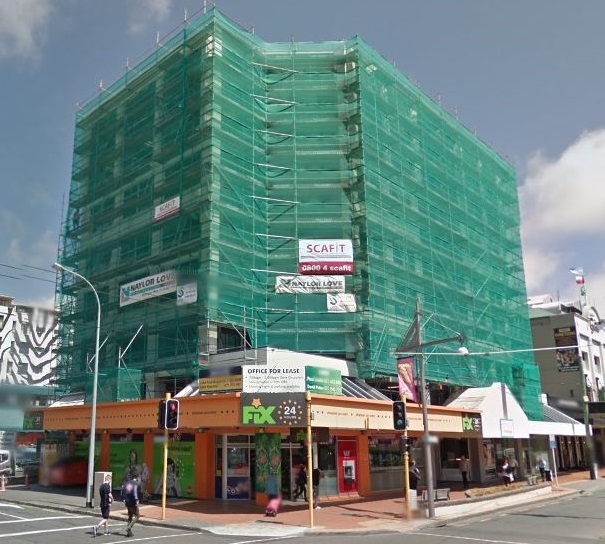 With a full make over needed, 59 Courtenay Place in the heart of Wellington’s nightlife district required a big scaffold. Three sides of the building needed routine maintenance and repainting. Sounds easy, but this job presented a lot of technical challenges, including an outside bar, footpath canopies with no load capacity, one elevation requiring full water tightness with loading bays inserted, and a car-park ramp which needed to have full access retained throughout the job. This job required a truly innovative scaffolding solution, with a real team collaboration between Naylor Love construction and Scafit, along with specialist input to meet the unique challenges. The high loads created by the cantilevered base and the shrink wrap required engineering sign off on Scafit’s proposed solution, thanks to Don Thomson Consulting and propping from RMD. A technical shrink wrap job was completed by John and the team from Absolute Wraps, including zipped entranceways to the three cantilevered loading platforms. Take a tour of the finished solution on Google Maps at https://goo.gl/maps/6vOR7. Thanks to all of the crew at Scafit Wellington, with great leadership from Doug, Kodee & Mike.